UMAP Student Connection Online (USCO) system is a user-friendly platform for communication, data storage and synchronization between students, home institutions and host institutions. Click here (Login page: https://usco.umap.org/std) to create your USCO account. 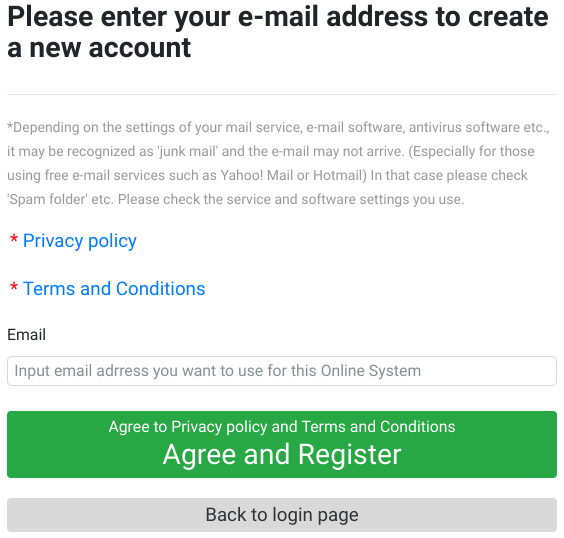 We recommend you to use an email address that is provided by your home institution. 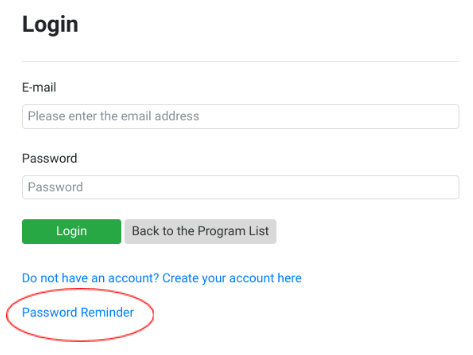 Input your registered email address and password to log in to the system. 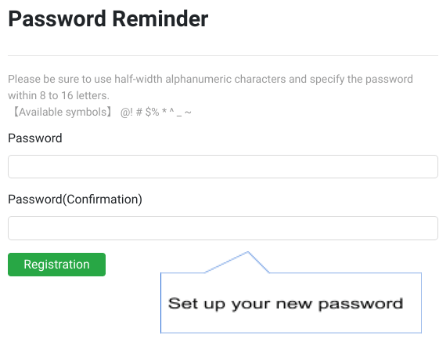 Make sure to fill in all required items marked with (*), such as Email, Password, Home Institution, Student Number, Gender, Nationality, Mailing Address, TEL, School Year, Graduation Date, Native English. Please double check your information before proceeding. After confirmation of your input, click “Save and Submit”. Maximum of 5 institutions can be selected for Program A/B and 3 institutions for Program C.
Pay attention to the application period. Because UTC (Universal Time Coordinated) is used, please be careful about each deadline. Only program cycle colored in orange is available for applying. Click the “Timeline” tab on the main menu to display the current timeline list and its details. UMAP open applications for our programs twice a year. Placement Period: (Students don’t have to do anything during this period) Your preferred Host Institution decides to either accept or decline during each placement period. When declined, the next target Host Institution will automatically be notified after the next placement period start date. *For native English speakers: If program indicates “Accept native English”, you don’t have to upload any language certificates. Please note that only Word/PDF format files, smaller than 15MB, will be accepted on USCO System. Check your information and submit the required documents (Transcript and Certificate of Official Language Exams). Note: When current applications are simply temporarily saved, the “Update” button will be displayed (“Student Basic Information” can still be changed). You cannot make changes to your information while you are studying abroad. If you need to make changes, please contact your Home Institution. Please contact UMAP IS within 7 days (including weekend). It will still be possible to apply. After 7 days, the temporarily saved data will be deleted. Click on a program in “Application List” to display submitted application screen. If any of these messages is displayed and you cannot apply to the program, please check the index below. After your application has been accepted, it is recommended to prepare your study plan. However, it is not mandatory. Please wait for an official notice from the Host Institution first, they might ask you what kind of curriculum you would like to study. Please communicate with them to finalize your study plan. Upload the plan after finalizing it. 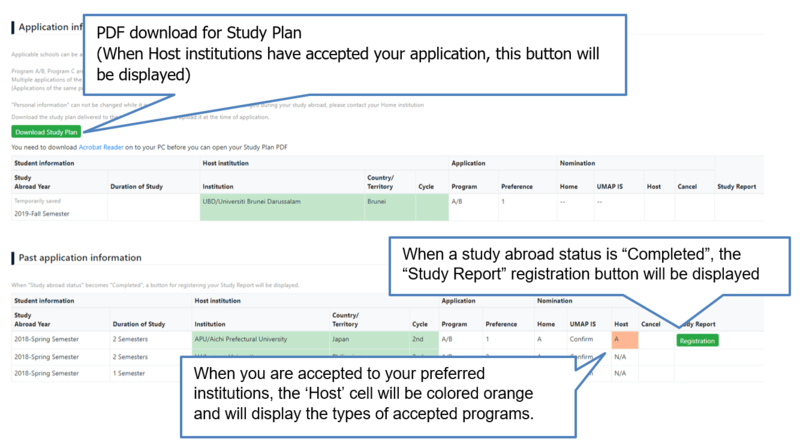 It is possible to register the study plan after communicating with the Host Institution. Please contact your Home Institution. Please contact UMAP IS by email: umap-is@umap.org. Please contact your Host Institution and UMAP IS by email. If you registered with your “Home Institution email address”, please contact your Home Institution for your email address. Use the login ID and Password which were sent by email from UMAP IS. Click “Institution > Coordinator Update” to view the screen. Update the contents timely whenever necessary. Choose “Institution > Coordinator List” on the main menu. Click on a coordinator to display their details. Choose “Institution > Institution List” to view the Institution List. You may submit your institution’s “Outline of Proposals” during the registration period. To check registration period, please refer to Timeline. To submit a proposal, choose your selected program type from the menu and enter your program information. Choose “Program > Program List”. Clicking on a column in the ‘Program List’ displays program details. 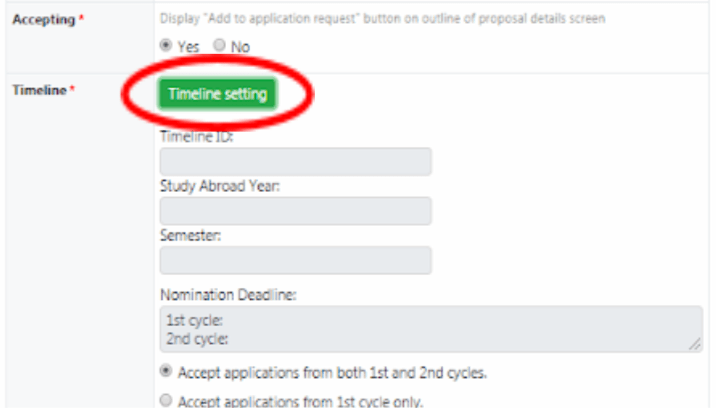 Click here and select an appropriate “Study Abroad Year” timeline. Program A is a student exchange program with the tuition waived and Program B is a program that is either under the Bilateral agreement or with the tuition charged. You are required to offer at least two students for Program A. Please click and adjust the number which you are going to offer. If you would like to offer your program with a tuition fee, you need to input the number of students you are going to accept. Please input the approximate cost in US dollars as well as the cost in your local currency. This is to automatically reject applicants whose scores are lower than the registered figures. 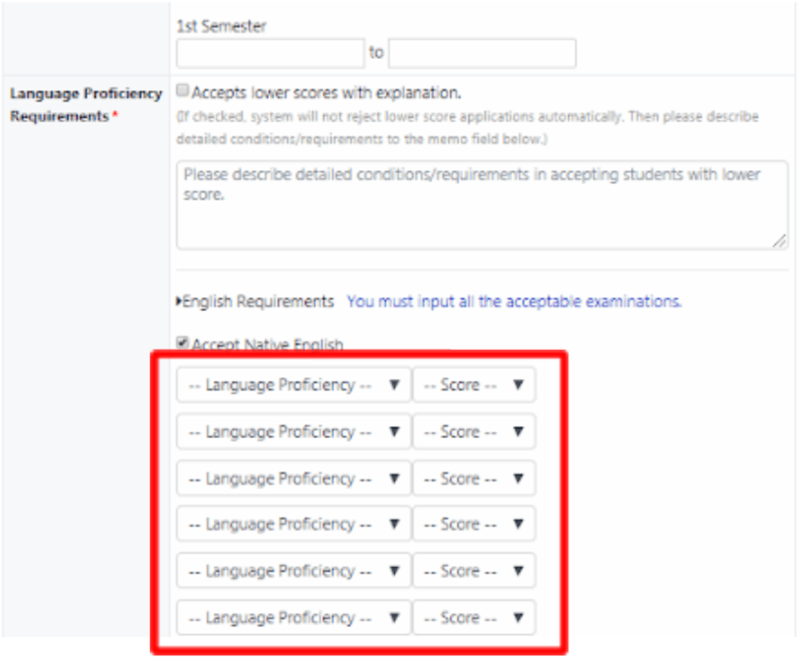 You need to input required scores of each Language proficiency tests. 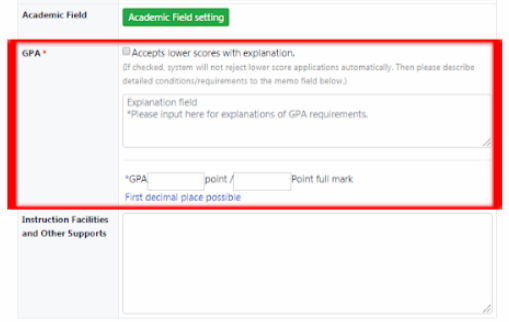 If you check “Accepts lower scores with explanation”, USCO system will not reject them. 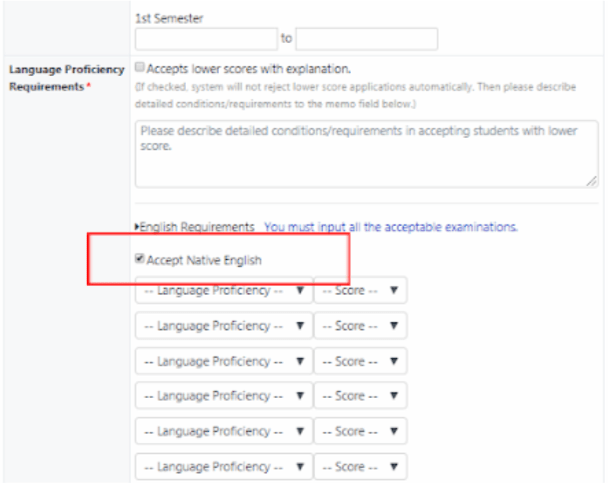 If you check “Accept Native English”, the system will accept applicants of English speaking Countries/Territories who usually don’t have English Proficiency Certificates. 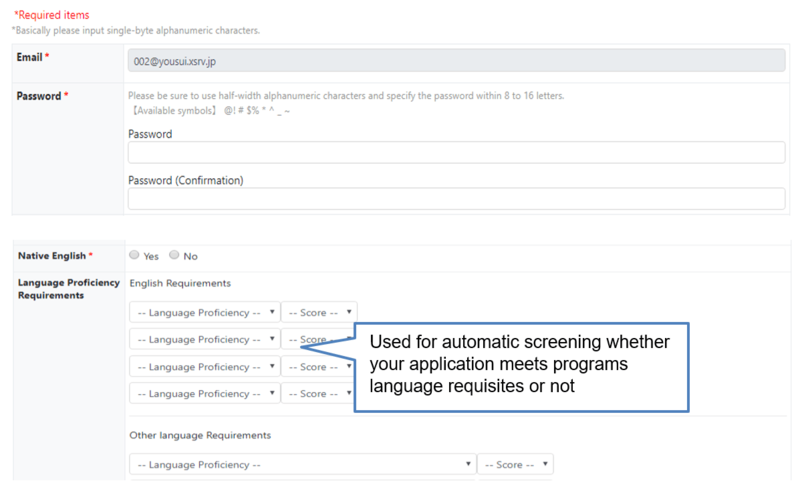 Without checking this, the system will automatically reject applications of those who don’t have scores of English proficiency. If you would like to set minimum scores in English Proficiency, you need to select the type of Language Proficiency Test and set the minimum numbers. Please note only those students who have equal or better scores of the registered tests are able to apply for your program. 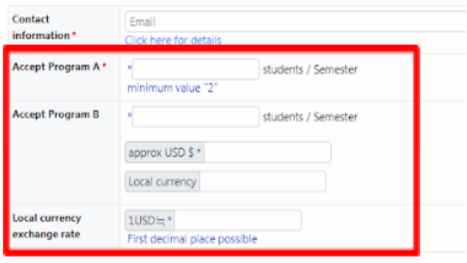 Input the duration of accepted students’ study period (either one semester or two semesters) depending upon your program. In case of a tri-semester system, please mention it in the explanation of your program contents. Afterwards, input the starting date and the ending date of the first semester and the second semester for the students. If students will start their study in the spring semester, the dates of the first semester should be that of the spring semester. 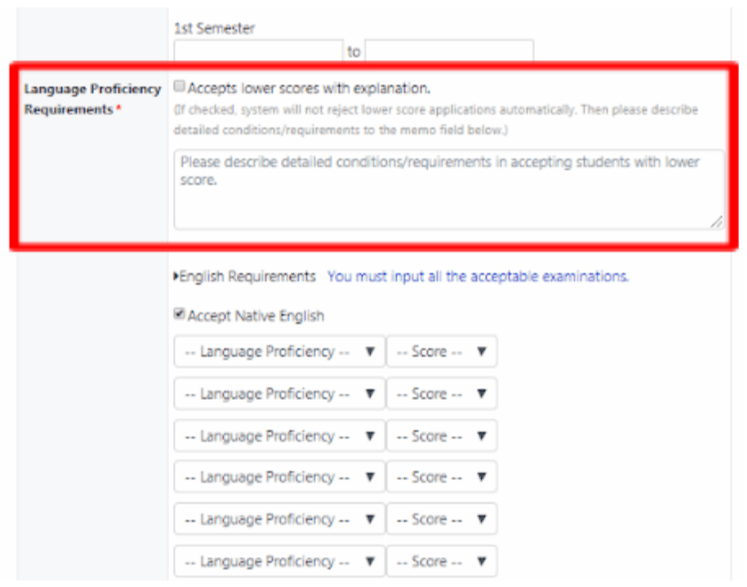 If you request language proficiency requirements other than English, please specify the language and set the required scores. Please click “Academic Field setting” and select faculties and fields that your institution will offer to exchange students. If you would like to set a minimum requirement, please input both the numerator and the denominator. If you don’t input the denominator, the system will not accept students unless they have a 100% score. 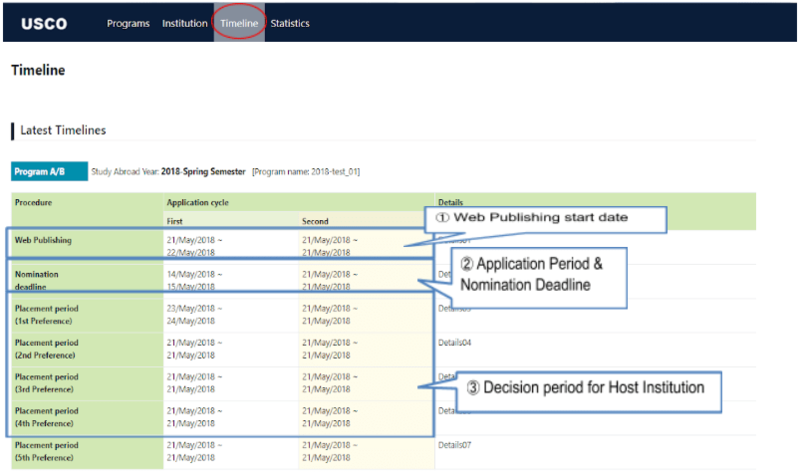 To view the valid timeline period for Program Registration, click “Timeline List”. Program registration period: Input Program Information during this period. Web Publishing: UMAP IS checks the uploaded information and activates them. Nomination by home institution: Students apply for programs and their home institutions’ coordinators select and nominate them. Placement period: coordinators of host institutions select applicants and accept them. You are able to check whether your students have applied for any UMAP program. To view all applicants, choose “Applicant > Applicant List” on the main menu. Please do NOT click multiple times! Click a student’s name in the ‘Applicant List’ to display the students’ details. 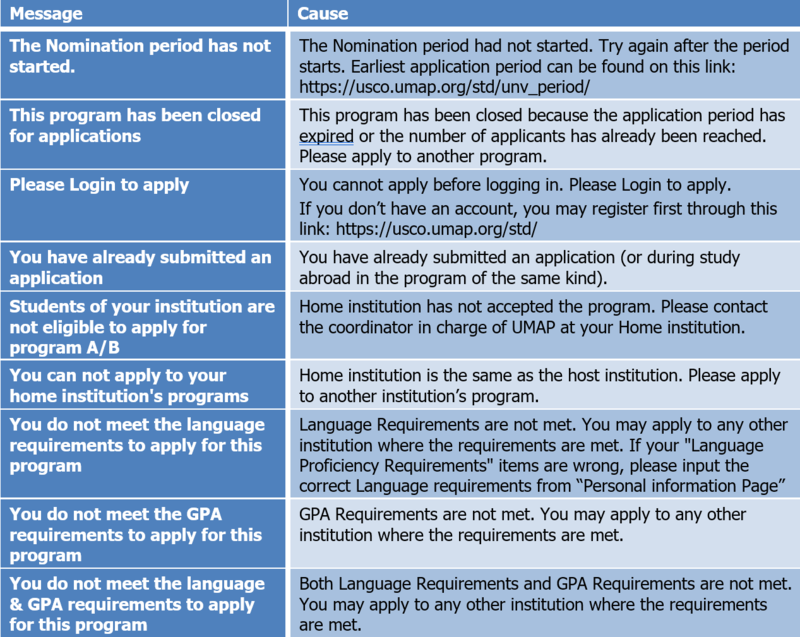 When applications are received from your students for UMAP Programs, decisions to nominate those students or not are required to be made by the nomination deadline in the USCO System. 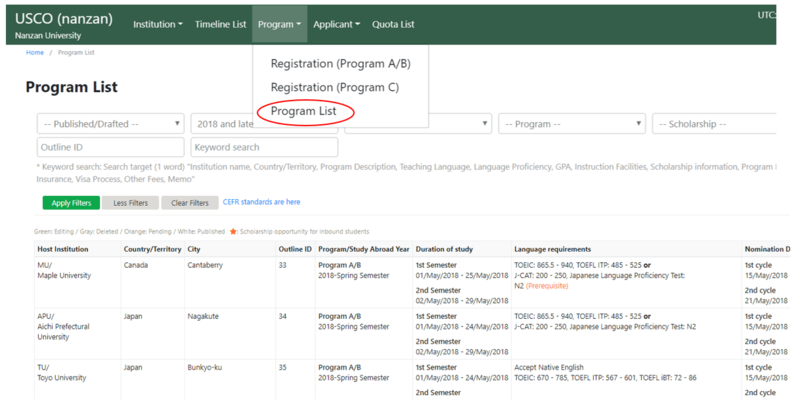 To see a list of applicants, refer to the “Checking Student Application List” and click a student’s name in the ‘Applicant List’ to display the students’ information. After checking the data of students, you must decide which student you nominate and which condition the student is nominated through. 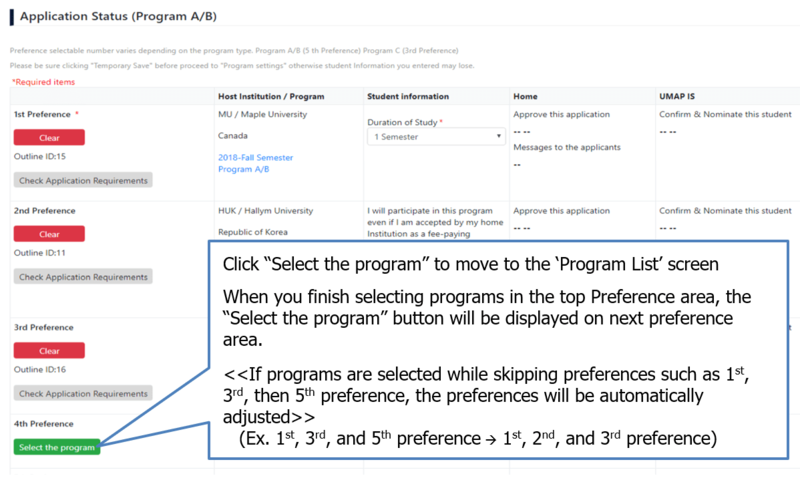 After making decsion on nomination, you need to select either Program A or Program B, and then click “Save and Submit”. Select the appropriate applicants and approve. 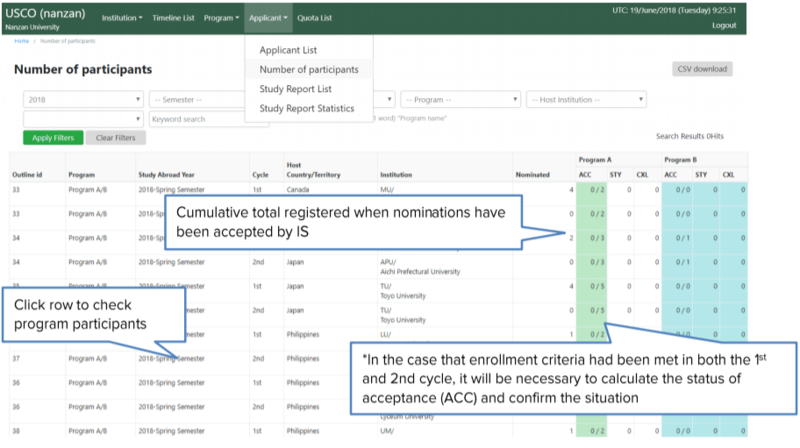 Once the host institution accepts your student’s application, the result will be displayed on the “Applicant List” screen. After the student is accepted by host institutiion, the student should communicate with the host institution and create a study plan. Accepted students can download a template of “Study Plan”. 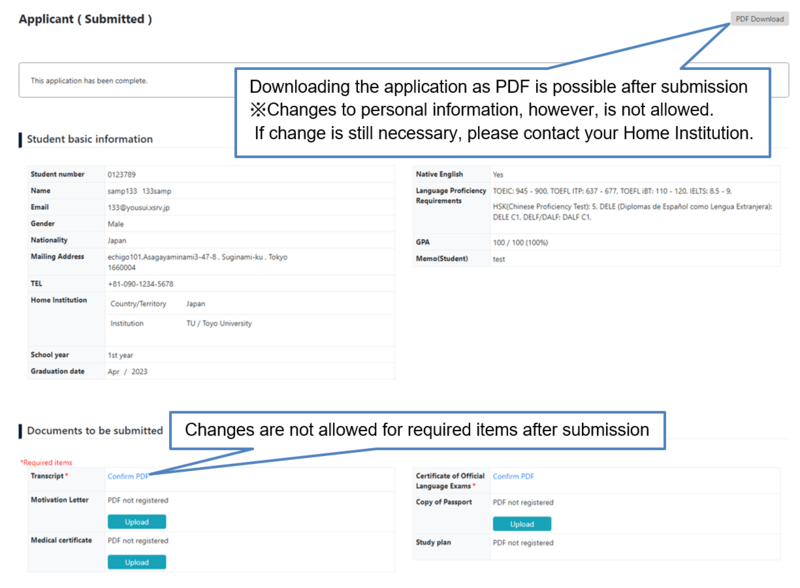 After nomination, you cannot modify the contents of student application. As a preferred host institution, you are requested to decide the acceptance or refusal of each applicant by the deadline shown on Timeline. If the number of applicants exceed the number of register acceptance limit, the host institution must select students to accept. If that is not done by the registered Timeline, applications will be passed to the next priority institution after the deadline. 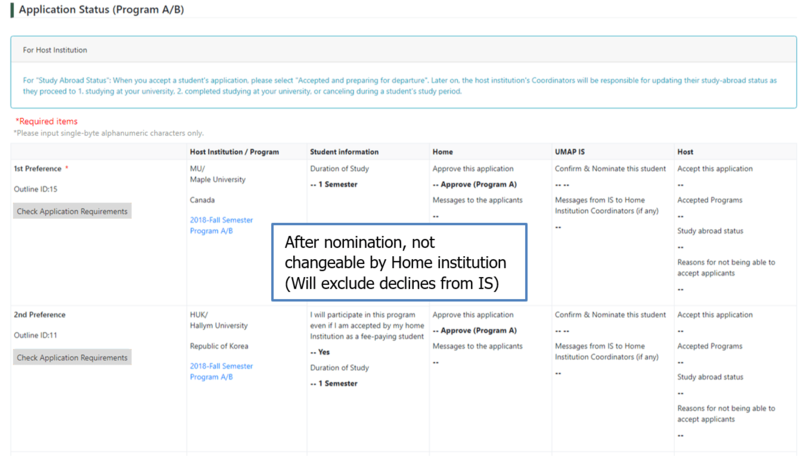 On the “Applicant List”, you can view students who have chosen your institution and were approved by their home institution and confirmed by UMAP IS. 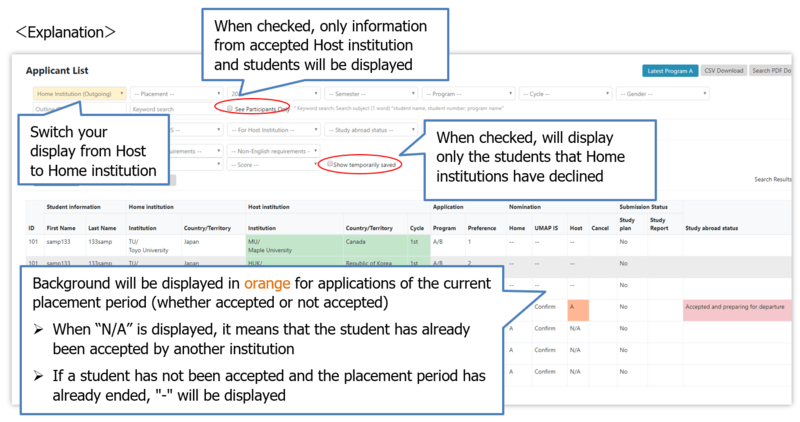 You need to decide the acceptance or refusal of those students with “Host” marked in orange color. Click on the name of the student who you would like to display that student’s information. You are able to see the Transcript and Certificate of Official Language Exams by clicking the data. 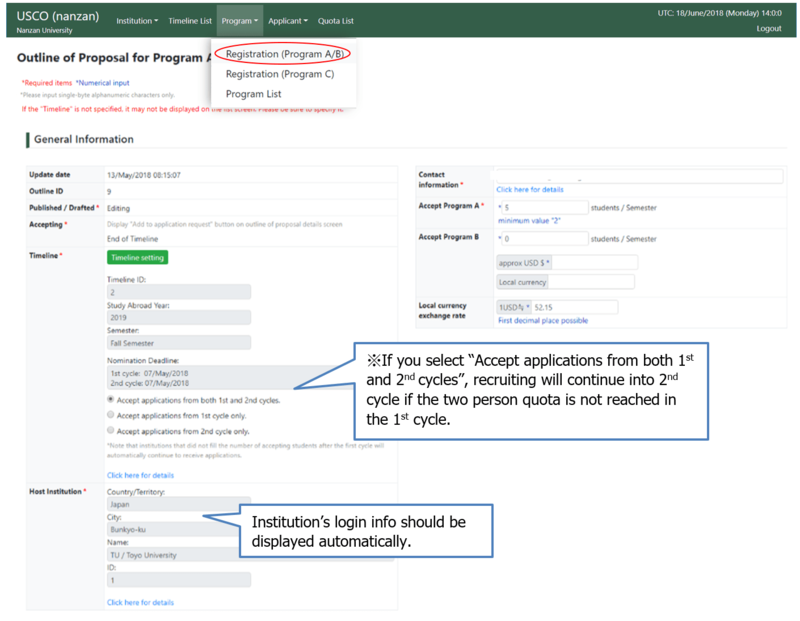 After reading the student’s information, please select either “Yes” or “No” to accept or decline the application on the “Application Status” section of the screen. Change number of accepting students: When the sign “Maximum number of accepted applications reached” has appeared and if you would like to accept more students than you had previously registered, please contact UMAP IS at (umap-is@umap.org) to change the number of recipients. When canceled, the background will be colored in gray. When accepted students start their study at your institution, please change the status to “Studying”. This function enables you to see statistical data which students of your institution studied abroad through USCO System. Click “Applicant > Number of participants” on the main menu. 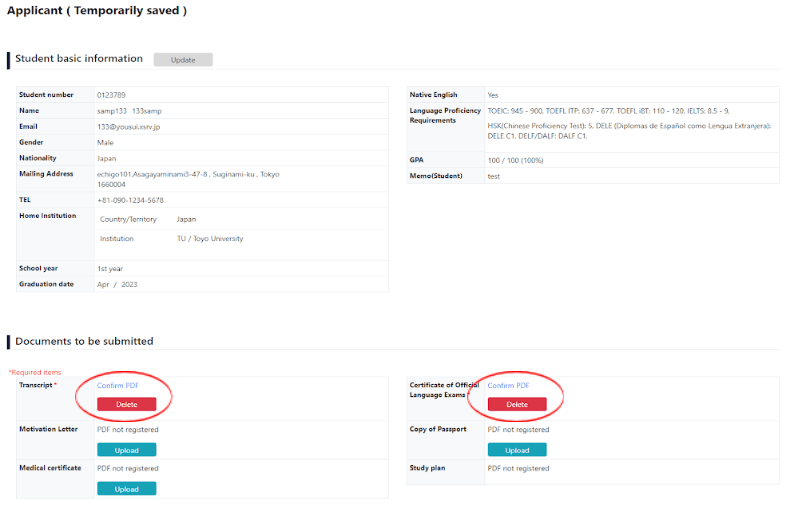 You are able to read ‘Study Reports’ which your students submitted in the past. Choose “Applicant”, then “Study Report List” or “Study Report Statistics” on the main menu. Quota List is the maximum number of students per institution that can be dispatched to study abroad, depending on which programs. Select “Applicant List” of “Applicant” on the top bar menu. Select either “Host Institution (Incoming)” or “Home Institution (Outgoing)” depending upon your purpose. In case that you would like to download a list of applicants who have placed your institution as the first priority, choose “ 1st” of “Placement”. If you do not select the priority, all of applicants such as “2nd” and “3rd” priority will appear in the list. Check “Year”, “Semester”, “Program” and “Cycle” are selected appropriately. Click “Apply Filters” and the list of applicants which you would like to download will appear in the screen. Click “CSV Download” and save the data on your Document holder (text data). Open the Excel spreadsheet and then open text data which you have saved on your Document. The list of applicants will appear on the spreadsheet.